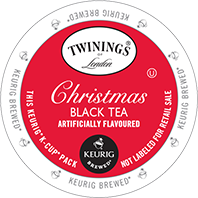 Twinings Christmas Black Tea K-Cup packs start with a selection of their expertly blended black tea and are infused with the traditional spiced flavors of cinnamon and cloves. This tea has a spicy aroma that will get you into that special holiday mood. Enjoy black or with milk and sweetener for a special holiday treat.